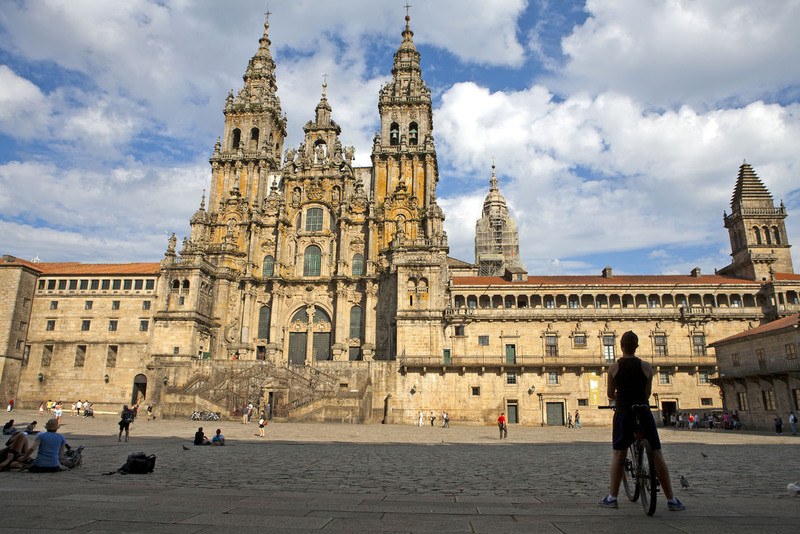 For centuries, Christian pilgrims have been shuffling across Spain, walking the Camino de Santiago towards the supposed remains of St James, Christendom’s first martyr, beneath the cathedral in the Galician city of Santiago de Compostela. In recent years, they’re being overtaken – literally and figuratively – by bikes, with statistics suggesting suggest that up to 20% of all Camino pilgrimages are now made by cyclists. I’ve been one of them, and it’s a ride so good I’ve lost all desire to ever walk the Camino. My own ride began in the city of León, from where I was to cycle 350 kilometres into Santiago, effectively pedalling from one grand cathedral to another. What elevates cycling above walking on the Camino around León is the nature of the meseta. The village of Castrillo de los Polvazares. This high plateau is akin to a Spanish outback: dry, clumpy, often featureless, tiresome. The Camino ambles through it on paths, but also along plenty of roads. It’s tedious enough that a lot of walkers avert their eyes from heaven and jump on a bus, skipping the section from Burgos to León. On a bike there’s no such need – in the course of a day, 100-or-so kilometres can have slipped behind. The journey from León to Santiago is varied. There’s Gaudi architecture, vineyards, nesting storks, brown lands and green lands, and pilgrimages within pilgrimages. Atop the Montes de León, the mountain range that marks the end of the meseta, pilgrims build a mountain of their own, dropping stones around the base of the Cruz de Ferro in one of the Camino’s oldest traditions. For a cyclist, the inner pilgrimage here is more secular, with the Montes de León being the site of one of the Tour of Spain’s most gruelling climbs. The Montes de León is not the toughest climb of the coming days though. Through Galicia, the Camino is an endless succession of hills. But there are also pulperias, cobbled bits of singletrack, brandy-fuelled afternoons, and none of the foot soreness so common to those we pedal past. Into Santiago, the traffic feels ungodly after a few days on trails and quiet roads, but it’s brief. Soon we’re into the old town, pushing our bikes through a tunnel to the vast square laid out at the foot of the cathedral. Pilgrims sprawl over the cobblestones, seemingly at a a loss after weeks of walking… or just a few days of cycling. As other pilgrims shuffle into the cathedral to pay their regards to St James’ remains, I discover my own unexpected, heavenly reward. A Tour de France winner is waiting to greet me (well, my cycling partner, but I claim it). If you want that story, here’s a link to it at Australian Geographic Outdoor. Andrew Bain cycled the Camino de Santiago with UTracks. I love your description of your Camino. My sister and I, while we slogged it out for weeks, met many wonderful cyclists, and envied their speed through those long, horrible stretches you mention, but certainly not on those gruelling up hills. Thanks Jolandi, I did get great admission for those walking it – there looked to be plenty of pain by the end. The one thing I felt I missed when cycling it was the sense of fraternity that walkers seemed to have from spending weeks together, focussed on the same goal. Yes, you are quite right. One does form quite a bond with fellow hikers, when walking. After weeks of spending time in an “alternate universe”, it was quite a shock to return to ‘normal’ life. We were lucky that we did not have to contend with blisters, like so many people do, but my leg muscles did rebel almost constantly. What an experience, though – be it on foot, bike or horseback. Sounds like another great adventure. I’ve seen movies and documentaries about El Camino de Santiago and would love to trek it. Thanks Andrew. It is a great route, Brad. Not the ‘wow, there are mountains everywhere’ kind of trail that just blows your socks off every day, but a real sense of purpose to it and a great fraternity among those on the path. They sure make it look good in the film I watched! I’ve wanted to walk this trail many times but until reading your post hadn’t thought about cycling it. Sounds ideal for the less interesting bits, although I’m not sure how I’d cope with the steep parts. Thanks for giving me ideas. Great post. Thanks for the blog. Heading to do a bike tour through Spain in a couple of weeks. Great insight! Thanks Nick. Hope you have a great time in Spain. I loved it. Thank you for the blogs and wonderful photos. Hi Andrew, I am planning on doing this in September and hoping to complete end to end by bike… Came across this site and then realised I already follow your adventures via instagram already! My biggest question I have so far is do I take my own bike, as I have a really good mtb? or do I hire one over there? I’m travelling solo via London, so will somehow need to get my bike case from the start to the finish, and have it stored until I arrive. Do you have any tips on that? Hi Narelle, social media sure has shrunk the world. Nice to hear from you. I’d be taking my own bike, if you work out the logistics. Most airlines will fly boxed or bagged (disassembled) bikes, so you might not need to have it stored ahead of your arrival. Otherwise, you’re likely to find a hotel somewhere around Roncesvalles that’ll store the bike – I imagine they’re well used to cyclists by now. If it becomes easier to hire a bike, I know Bike Iberia does hires and, for a fee, they’ll deliver the bike to your start point. There are also a couple of bike shops in Santiago (Tounride and Cycling the Camino) that specialise in hire bikes for the Camino. Good luck with it – the end to end ride would be amazing.